BBC Radio 4 - The Food Programme, What Delicious Future? Dan Saladino looks at the ideas that could make a big impact on the future of our food. 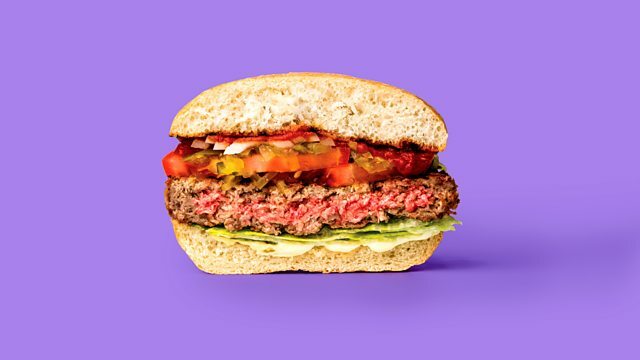 Dan Saladino looks at ideas that could make an impact on our food future featuring America's Impossible Burger, a Sardinian maggot infested cheese and mussels being grown in downtown Copenhagen. Most people are aware of the challenges that lie ahead linked to predictions of population growth peaking at 9bn by 2050 but who is coming up with ideas of how we can feed more people with a finite amount of land, water and other resources? Dan looks at three ideas that provide an insight into work underway to find solutions. The expert on the science of cooking Harold McGee, author of On Food and Cooking: The Science and Lore of the Kitchen, tells the story of The Impossible Burger, a decade long endeavour, based in California, to find a plant based replica of beef and burger patties. Impossible Foods was founded by a bio-chemist Professor Patrick Brown. Because he was approaching the problem of rising global meat consumption from outside of the food industry he was forced to ask some very basic questions, most important of which was "why does meat taste like meat"? One of the answers Pat Brown discovered was a molecule called heme. He also knew heme could be found in plants. The outcome of years of work and millions of dollars of investment is The Impossible Burger. It's aimed not at vegetarians or vegans but meat lovers and has been designed to have the meaty, bloody juiciness of a real burger. Harold McGee describes the science behind the burger and the experience of eating one. By the way, listen out for the traditional Sardinian music "Su Cuntrattu de Seneghe" performed by Antonio Maria Cubadda who is from Seneghe town. The next future food story has its origins in Sardinia and a cheese called Casu Marzu. As the cheese ferments a fly called the Cheese Skipper is attracted by the aromas being released and lays its eggs inside the cheese. The larvae then hatch and start to digest the proteins and turn a hard textured cheese into a soft one. The cheese is then eaten while the wriggling maggots are still alive within the cheese. A researcher working for the United Nation's Food and Agriculture Organisation's Edible Insect project, Afton Halloran went in search of the cheese as a rare example of a European food involving edible insects. In Sardinia she met a chef Roberto Flore . They eventually married and since, have travelled the world in search of other examples of edible insects that could provide a clue to future foods. They tell Dan the story of the cheese and the conclusions they've reached so far when it comes to the potential of insects in feeding the world. The final story comes from Copenhagen where Joachim Hjer is attempting to get people in the city to grown their own mussels in the heart of the city. In the studio with Dan is Dr Morgaine Gaye, a "Food Futurologist" who explains which of the three stories she believes will be the one to watch in 2018. Presented and produced by Dan Saladino. Could insects feed Kakuma Refugee Camp? Can comfort foods really make you feel better? Yes they can, says Sheila Dillon.